A quick update on a plucky startup we’ve covered over the past few years: CustomMade, an online marketplace that connects craft makers and consumers, has scaled back to eight employees but is continuing operations after the majority of its staff was hired by Wayfair, the Boston-based home goods retailer. 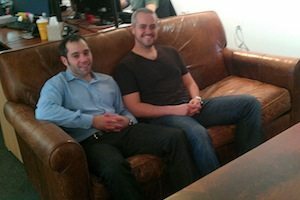 The hiring news was first reported by BostInno, and I’ve confirmed details with CustomMade co-founder Seth Rosen (pictured above, at left, in an old photo). As part of the transition, CustomMade CEO and co-founder Mike Salguero (at right in the photo) is leaving the company to pursue other opportunities; no details on that yet. Rosen is taking on the CEO role, and vice president Sasha Shusteff will be stepping up to run product and engineering. Rosen is also chairman of the company’s board of directors. Rosen and Salguero bought CustomMade.com in 2009 and retooled it with around $25 million in venture funding from investors including Google Ventures, Atlas Venture (tech side of the firm), and Schooner Capital. The goal was to give consumers a custom-built experience—for goods like furniture, woodwork, and ceramics—at a price competitive with traditional retail. Last I checked, the Cambridge, MA-based company had more than 30 employees. Meanwhile, Wayfair (NYSE: W) had its high-profile IPO last fall and has been continuing to build itself into an anchor tech company in Boston. The CustomMade hires shouldn’t hurt its progress in that respect. “Mike and I both enjoy a very close relationship with the founders and executive team over at [Wayfair],” Rosen says.